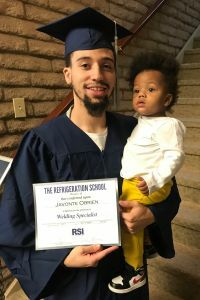 Javonte, 26 from California, graduated from the RSI Welding Specialist program in September 2018. Thanks for sharing your story, Javonte. Tell us about your career before RSI. I had been in and out of jobs like warehousing and security, but nothing that required schooling or a trade. I was just bouncing around working regular jobs. Welding was a complete career change. Had you tried school or college? I did try school. I went to community college and got my advanced first aid/CPR certification. I was going for a career as a firefighter before I got in trouble with the law. That hurt my chances, so I had to switch. Why did you choose welding? A friend was a welder. He introduced me to it and told me how much money you can make. I was interested. I wanted to have skills that would last, something that I could work on, get better at, skills that are needed. I debated doing it for about a year. I looked at the occupation, the job growth rate for the next few years and decided it would be a good career to get into. My girlfriend Tiffany and I moved to Arizona in June 2017. As soon as I got a job, I went ahead and applied to RSI. I had researched different schools’ graduation rates, job placement rates, reviews—I looked at all those things. I leaned toward RSI because it was a new welding program. I was excited about the new equipment and it didn’t have bad reviews. I also saw that RSI is associated with Tulsa Welding School, one of the top welding schools in the U.S.. That really caught my eye. I went to visit the campus and decided to jump in. I wanted to start sooner than February 2018, but I had to wait a little, which was fine. New opportunities and a different environment. Tiffany was pregnant when we moved from California. I wanted to do what would be best for my unborn son, who is now 14 months old. I wanted to put myself in a different position, to separate myself from my friends. I needed to get my head on straight to make sure I could give my son a good life. Just learning constantly. Every week there was something new to get my mind around. The welding was great, and the instructors encouraged me. They motivated me not just to be a welder, but to become a great welder. They weren’t just worried about how we did in school, but how we would do outside. They gave tips from their experience and point of view to help us overcome obstacles. Had you done any welding before? Never touched it. Didn’t know hardly anything about it. I was kind of skeptical. I didn’t know if I was going to be good at it, or if I would like it. After taking a loan out, would I be committed to doing the whole course for seven months? I didn’t know. I just took a leap. I didn’t have a passion for it, but I started growing one. It took about a month to know I made the right decision. You work for a structural steel company now. How did you get the job? The career services team got me opportunities to test at places that I couldn’t even get a call back from when I tried myself. Thanks to Rick White (RSI Career Services Director) and the team. They put a lot of effort into reaching out to HR people. I was patient, working with them to see what I could do to improve. Then the next thing I know I got an opportunity with Pro Steel Erectors in Glendale, AZ. They specialize in commercial and industrial steel erection projects. I started at the beginning of December. I’m currently working on a structural project at a job site in Chandler, AZ. I’m okay where I’m at right now. I know the first time you get out of school, it can pretty tough to get a good gig. I understand I have to start somewhere. They are competitive in their pay. It’s above average, which is fine, and there are opportunities to increase my pay. I’m still working my warehouse job part-time, just for the next 90 days until the benefits kick in. I’ve been at this warehouse job for 18 months, which is the longest I worked anywhere. Having a family has made me more responsible. What’s your career plan for the next five years? I want to be more knowledgeable and experienced in structural welding, and also more advanced in pipe welding. I’d like to be part of a union down the road. Making a per diem would be a bonus. I think I’d like to work for the county or the city. They have higher-paying jobs with better-quality work. I’d like to see myself work some big projects like stadium or bridges. I want to stay in Arizona to get my experience, then be able to go back home and get that top dollar in California. Did you make some lasting connections at RSI? Definitely. Networking is almost the number one thing that RSI talks about. Your friends and contacts are important. You might get cut from a job, but your buddy might have a gig where he can get you in. It’s good to keep in touch, or be social with other welders. You don’t know what kind of jobs people may land down the road. I have stayed in touch with a few of my classmates. Seeing the quality of my work improve, seeing myself get better at my craft every day. Welding is a skill that you constantly have to work on. I also look forward to being able to drive down a road with my son and point out a building or a bridge that I helped build. What advice do you have for new students just starting out? Be confident in yourself and your work. Be adaptable. Working hard always pay off. It will get you somewhere good. Stay motivated, keep your head high and do the work that no one else wants to. Never give up. There were times going through school when it was tough. But it’s your money that you’re paying, and this is a skill you can use for the rest of your life.